This post was also featured on Cookbook Create. Ooooooh Halloween, I’ve been waiting for you ALL YEAR LONG. Not because I love the holiday. 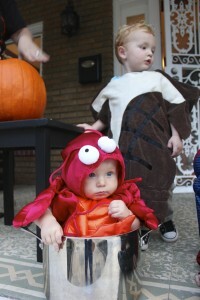 But because I saw this adorable picture of a baby in a lobster pot when I was pregnant, and I have been obsessing about recreating it ever since! This year, we were Surf & Turf. 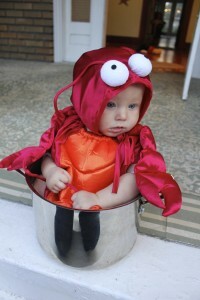 The baby is the surf in a borrowed baby lobster costume. The toddler is the turf. I found that toddler steak costumes were hard to come by (A.K.A. non-existent) so I ended up making it. I used two old dark brown bath towels (that I sewed together with a gap for his head to get through), some off-white felt (for the T-bone) and black gross-grain ribbon criss-crossed along his front (for the “grill marks”). 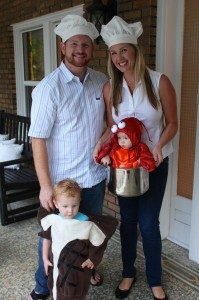 What are your favorite family-themed Halloween costume ideas? Tell me in the comments section below!